Just as during the previous 32 editions, Suikerrock will take over the historic city centre of the sugar city Tienen. 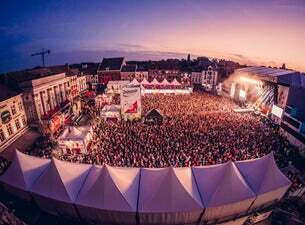 The Grote Markt, the second-largest main square in the country, will remain Suikerrock’s heart and soul with its Main Stage and national and international performers. The Grote Markt remains the corner stone of the festival, but in addition the Cattle Square and the streets in between the Grote Markt and Veemarkt will complete the Suikerrock circuit. On the Veemarkt, all attention will be focused on the younger crowd with great DJ sets for three festival days in a row. More than ever, you will be able to feel and see Suikerrock in Nieuwstraat, the Hennemarkt, the Wolmarkt and Peperstraat. The Grote Markt atmosphere will also be extended to these areas and visitors will be able to enjoy quality drinks and food stands and great presentations. You will be able to literally feel, taste and see the new Suikerrock: Feel the vibe, taste the sweetness! Bazart, Tourist Le MC, Tom Odell, Yves Paquet – more names TBA soon! Goose, Zwangere Guy, SONS, Black Leather Jacket – more names tba soon! Marco Borsato, Niels Destadsbader, Rob De Nijs, Nielson - more names tba soon!